(Test before Use - trials are Essential). Polymer reinforced concrete (PRC) is more flexible and sticks better to other materials than normal concrete without the addition of polymer. It may be well considered for use as robust, durable, high performance, low shrinkage, road pavement wearing courses as well as for cost-effective asphalt road pavement rehabilitation and other screeded topping or overlayment finishes. Flexible, highly adhesive, thin section (PRC) concrete overlayments can be permanently through-coloured in a range of permanent low glare, asphalt black or concrete grey, white and other colours or left plain unpigmented without the addition of pigments using Types GP(general purpose) grey or HE off-white Portland cement binders. In this simple, easy-to-make and use system Ability’s abil-strength® superpolymer powder admixture is used with but added separately to Ability’s Cosmotron® DPUAC high purity, 100% active super plasticiser / super water reducing powder admixture or another brand of this latter admixture type in a liquid form. These two admixtures are added and mixed into a suitable standard grade of pre-mixed concrete. • STRONG polymer (plastic resin) reinforcement obtained from special tough, flexible and highly adhesive polymers contained in Ability‘s abil-strength® powder concrete admixture. • a semi-flexible, QUIET ride, low decibel, ‘whispering’ motor vehicle trafficked surface. • HIGH water resistance and impermeability to liquids after recommended but not essential suitable moist curing of the placed overlayment. • HIGH impact and abrasion resistance. • HIGH durability, toughness and LOW maintenance. • HIGH shear bond strength to prevent loss of adhesion (‘drumminess’). The maintenance of excellent long-term adhesion of this low shrinkage concrete overlay to a base cement or bitumen bound road pavement concrete as well as its feature of LOW shrinkage to reduce the incidence of visual cracking between sawn jointing and a very low tendency to suffer from deformation, ‘shoving’, ‘pumping’ etc are important low maintenance properties for such uses. • IMPROVED tensile and flexural strength to further reduce cracking potential. • LOW Young’s Modulus (modulus of elasticity) for greater flexibility. • HIGHER chemical resistance eg in salty chloride marine environments and those near the sea, than a non-admixtured normal concrete equivalent at the same ƒ/c ultimate mechanical strength. • AUTOMATIC pavement surface crack and small hole filling and surface levelling during application as well as more than adequate compressive strength. Ability’s abil-strength® and high purity Cosmotron® DPU-AC rapid dispersion 100% active solids admixture powders for concrete and mortars are suggested for use by means of your comprehensive evaluation at a starting point testing dose rate of respectively 5% - 10% and 0.4% by weight of the cementitious binder weight. For your essential trials to be undertaken prior to use, these high performance admixtures can be specified for use by simply adding them (by weight) and dispersing them thoroughly into the barrel of the pre-mixed concrete transit truck containing preferably an ideal quantity of 4m3 of a prepared standard (typically a 320kg cement content) Granolithic (‘Grano’) mix containing no admixtures. This concrete is made to a 40mm SLUMP and then re-mixed at the mixing speed for 6-8 minutes after the admixtures are added - in a similar way to which abilox® mineral oxide powder pigment colours (if added) are uniformly mixed and dispersed into prepared wet plastic pre-mixed concrete - which would be carried out if the overlayment is to be permanently integrally coloured such as for say red and/or green coloured bus, bicycle and turning lanes. For more information about through coloured concrete you may wish to request the Ability Technical Paper ‘COLOUR PIGMENTS FOR CONCRETE: THEIR POSSIBILITIES FOR ENHANCING ARCHITECTURE, LANDSCAPE ARCHITECTURE AND CIVIL ENGINEERING’. Both Ability admixtures added to freshly mixed plastic concrete at the above indicated dose rates, and thoroughly re-mixed at transit mixer mixing speed (18RPM) usually has the effect of increasing the concrete’s consistency from a 40 mm slump to one of approximately 80-100 mm for easy-to-use flowing discharge and placement WITHOUT the addition of further water. When using abil-strength® alone, the concrete made previously to a 40mm slump will result in the concrete having an 80-100mm slump approximately for use. BOTH admixture powders contain ANTI-FOAMING agents, which should minimise macro air void encapsulation in the re-mixed plastic concrete the occurrence of which is counter productive to obtaining full strength of the strength potential of any grade of pre-mixed concrete used. This means that normal compaction by vibration to remove air bubbles with say poker vibrators, which except for the use of spiked rollers would be difficult at an application thickness of only 25 - 30 mm, may not normally be considered necessary. Compaction/vibration by means of the use of spiked rollers, automatic straight edge vibrating screeding or in certain cases even with a vibrating/’dumping’ ‘Kelly’ float could also be considered (with the latter type of floating machine the concrete would need to be made and placed at a lower slump ie supplied at an appropriate slump of say 20 mm and after the addition of the two (2) admixtures and re-mixing, placed at an approximately 50 mm slump, all of which should be confirmed by testing). 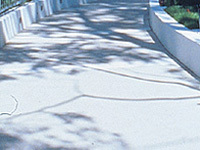 This special ‘Grano’ (Granolithic) pre-mixed concrete mix modified with abil-strength® superpolymer and Cosmotron® DPU-AC water reducing admixtures should preferably be placed onto an existing pavement requiring rejuvenation and repair, previously vacuumed free of dust, loose particles and lightly but uniformly dampened with potable water (not saturated and having no pooled water), by fast automatic paving train laying and finishing equipment, followed by the application of a suitable liquid membrane curing compound coating conforming to Australian Standard AS3799-90 LIQUID MEMBRANE FORMING CURING COMPOUNDS FOR CONCRETE AND MORTARS. Ability provides such a product called Duro-Seel Clear. 7 mm HARD, LOW POLISHING, quality coarse aggregate - crushed and ‘cubical’ in shape without ‘flats’, or in the form of suitable water worn 7mm stone pebbles. DRY weight normal, high quality ‘low water demand’ washed concrete sand. [Multiply by 1.07 for damp weight having (say) 7% moisture]. TYPE GP fresh grey Portland cement plus 9kg abilox® ‘Midnight’ Black Iron Oxide if an asphalt colour is required, or for brighter, ‘cleaner’ colouring effects for integrally coloured overlayments for say colour delineated bus, traffic light controlled intersections and/or turning lanes using other abilox® colouring pigments from the range of 60 colours available. Fresh Type HE off-white Portland cement eg: Blue Circle off-white or Adelaide Brighton’s ‘Brightonlite’ cement, is highly recommended for colour delineation work. Ability’s Cosmotron® DPU-AC normal set (non-set retard) high purity, super water reducing superplasticising powder admixture (0.4% by weight of cement weight). One (1) Concrete-Friendly® degradable paper sack (20 kg net) of Ability’s abil-strength® normal set (non-set retard) re-dispersible superpolymer powder admixture for concrete (approximately 6% by weight of cement weight). 1. The dose rate of the abil-strength® admixture may be increased at higher cost for potentially increased performance. Further information is available upon request. 2. Both Cosmotron® DPU-AC and abil-strength® admixture powders the standard packing of which are 15kg and 20kg respectively can, on firm advance order, be supplied in any other size - in exact weight batch size units if required - all in dispersible / degradable Concrete-Friendly® sacks. THE NORMAL PACKAGING for each of the two (2) admixture products is: Cosmotron® DPU-AC powder - 15 kg net Concrete-Friendly® multi-wall degradable paper sacks. abil-strength® powder - 20 kg net Concrete-Friendly® degradable multi-wall paper sacks.